CERAMIC APPLICATIONS is the platform (print and on-line) for advances in the development of ceramic components and their integrative design in complex industrial solutions to realize sustainable, economic applications in a wide range of user segments. Design engineers need continuous updates on innovative applications of ceramic materials as they can provide extraordinary combinations of mechanical, electrical, thermal and chemical properties for enhanced system engineering. CERAMIC APPLICATIONS aims to bridge the knowledge of ceramic manufacturers and the design engineers in the various industrial user sectors. Central themes of the new publication are best practice stories, user feedbacks, market information, previews/reviews on events, technology insights and supplier profiles, as well as news items on companies, people, products and events. be collected step-by-step in the »KNOWLEDGE CENTRE« on our homepage to be available for reference at any time. Further relevant technical articles will be available for an accentuated literature study. 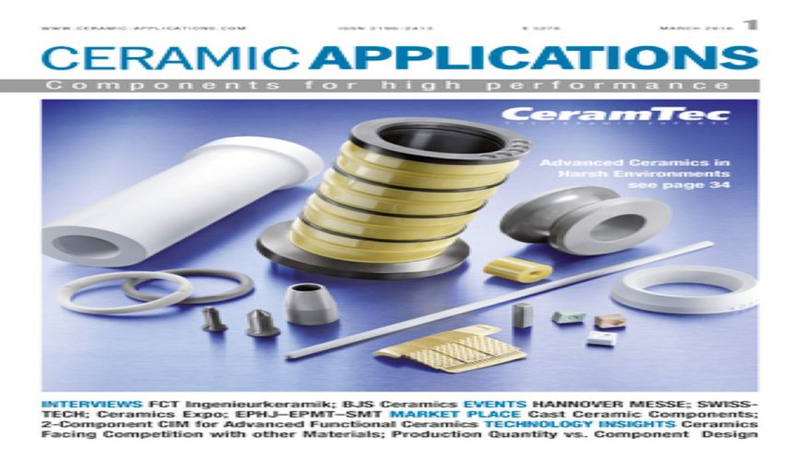 The editorial team is supported by several expert groups operating in the field of ceramic process engineering, engineering mechanics of ceramics, material testing and applied science for the development of new components, material combinations and their integrative design.